Alta Peak Chapter will be the sponsor and organizer for the 6th Annual Green Faire, that will be held in conjunction with the native plant sale at the Three Rivers Arts Center. Environmental groups and non-profit organizations may have a complimentary table/booth to share information with the public. Artists and crafts persons are invited to sell their work in booths, both inside, outside, and in part of the parking lot of the Arts Center. Artwork can be in any media but must be inspired by the natural world, or be made from recycled materials, or reflect aspects of environmental concern. Booth sizes are variable and not necessarily the standard 10 x 10 ft square. Booths are available both inside the Arts Center and outside, in the front yard and part of the parking lot. 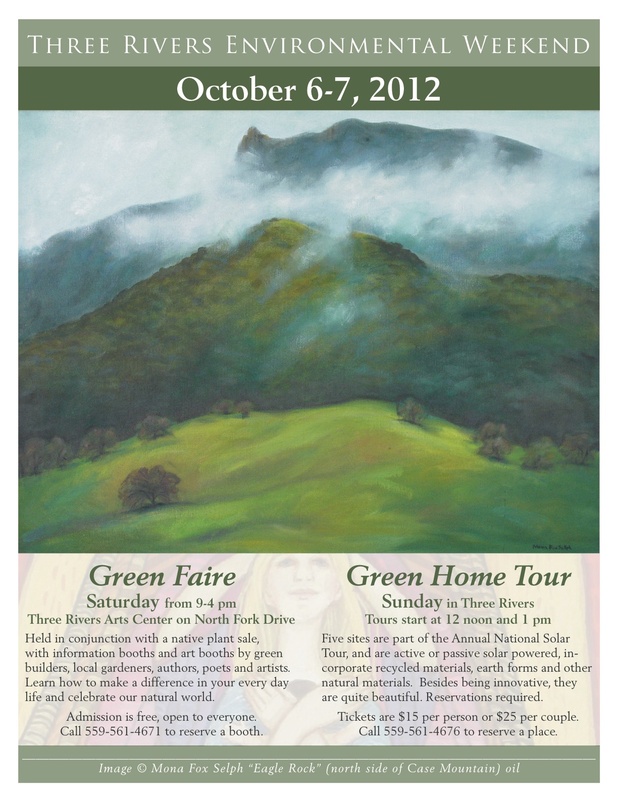 The Green Faire will also be part of the First Saturday arts event that day. Booth fee is $10, payable to CNPS. No percentage of sales is required. Deadline for booth registration is September 28, and must done by calling Elsah Cort at 559-561-4671. Booths must remain open from 9-4 pm. Five special sites, located throughout Three Rivers, are on the Green Home Tour, which is now in its 6th year and is part of the Annual National Solar Tour. Each location showcases active or passive solar powered, incorporate recycled materials, earth forms and other natural materials. One site is a multi-purpose garage, gym, and yoga studio built to Leed gold certification. A 6.5 KW solar system is mounted on the roof, and a west facing green living wall helps cool the space, and is a lovely hanging garden. Besides being innovative, all the sites are quite beautiful. Reservations are required for the two tours, one starting at 12 noon and the other at 1 pm. The groups will carpool to the locations. Tickets are $15 per person or $25 per couple. Call the Tour Organizer, Mona Selph, at 559-561-4676 to reserve a place. Proceeds go to the Sierra Club Legal Defense Fund for assisting with our local issues.